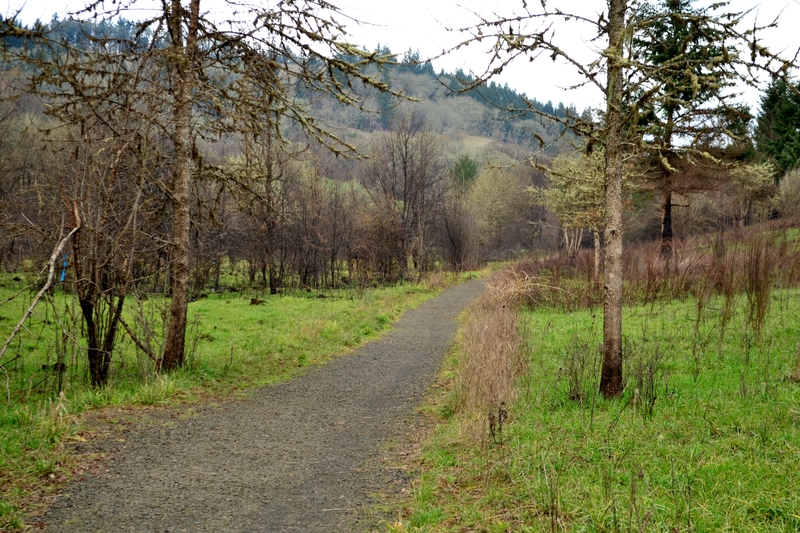 Timberhill Natural Area, Corvallis Oregon. From satellite view it may not look like the rooftop of your local grocery store. On foot there’s no check stands, no courtesy clerk, no aggressive advertisements or an overwhelming variety of product. Instead, Timberhill is an open span of serenity surrounded by practical beauty. When looking for a “clean” place to forage, consider these 3 things: Does this lands source of streams/creeks originate from or come into contact with human developments (Industrial/Business parks, Highway/Street runoff)? How far off path will the plants be from human/pet traffic? Was this land at one time used for conventional farming and or was chemical spray used? 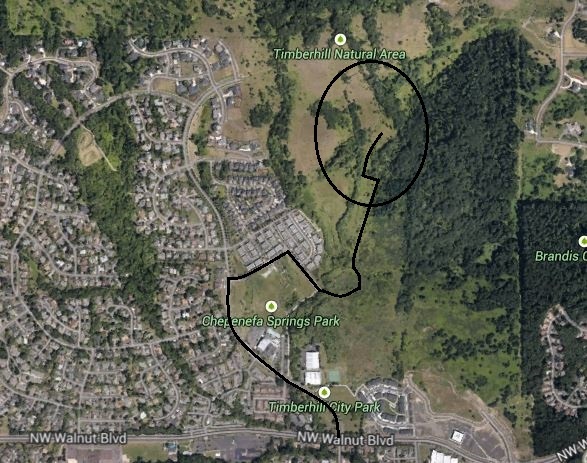 When judging the Timberhill Natural Area, I feel pretty safe knowing this hillside has very few developments on or near its summit. 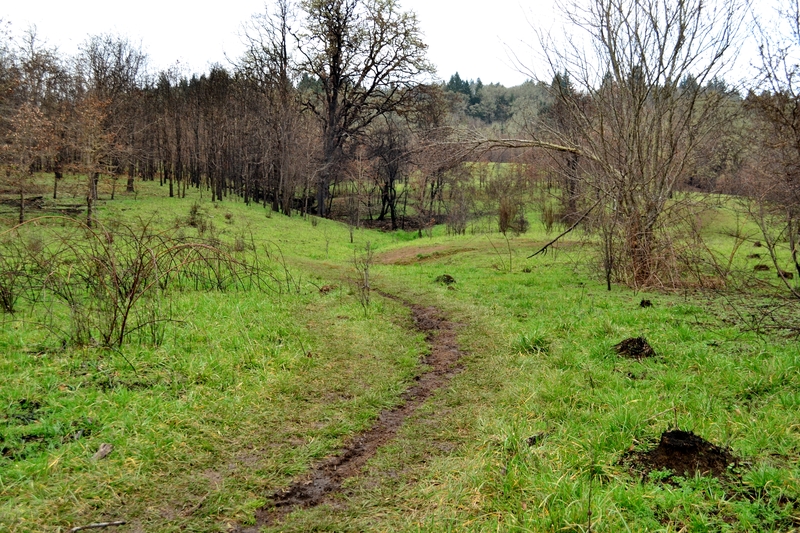 Its network of trails have wide open fields in between them, greatly reducing the plants exposure to pets “marking their territory”. And as far as I’ve seen there’s no visible effects of chemical plant spraying. Green light, Go! For a January salad, “when” may seem like a redundant question. 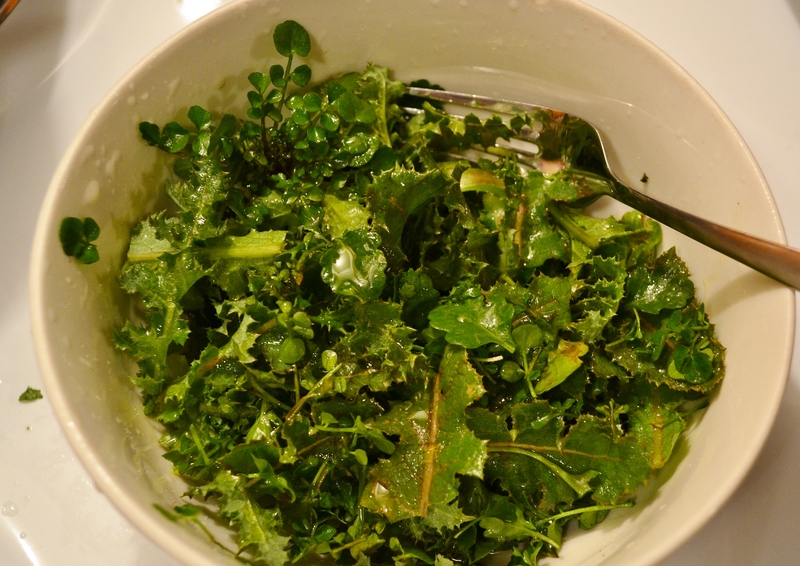 But really anytime during the mid season of winter to mid-spring is a great time for collecting greens. At this point their vegetation has begun to grow and yet they are still far from maturity. The leaves are fresh, tender and succulent. And because there is yet any flower production you can avoid any associated bitterness. 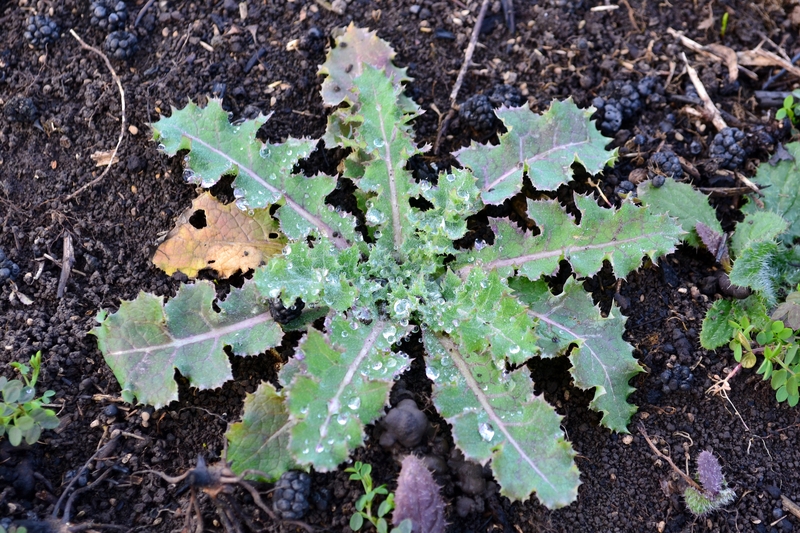 Thistle belongs to a large group of edible plants. 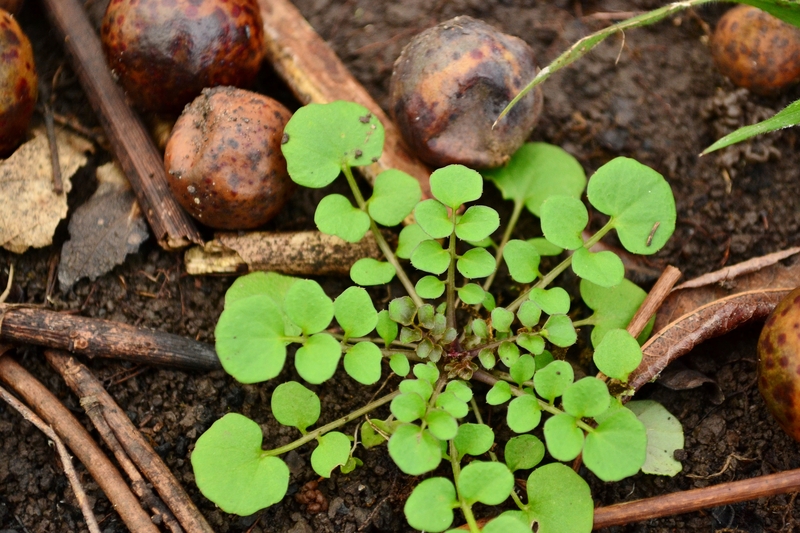 The not so bitter Bittercress. These three plants may not seem like much of a variety, however each is very unique in both flavor and texture. This is a great time to be picking Sow Thistle. Right now its spiny leaves are still soft and palatable. It has a flavor similar to fresh spinach with a crunch like that of ice burg lettuce. 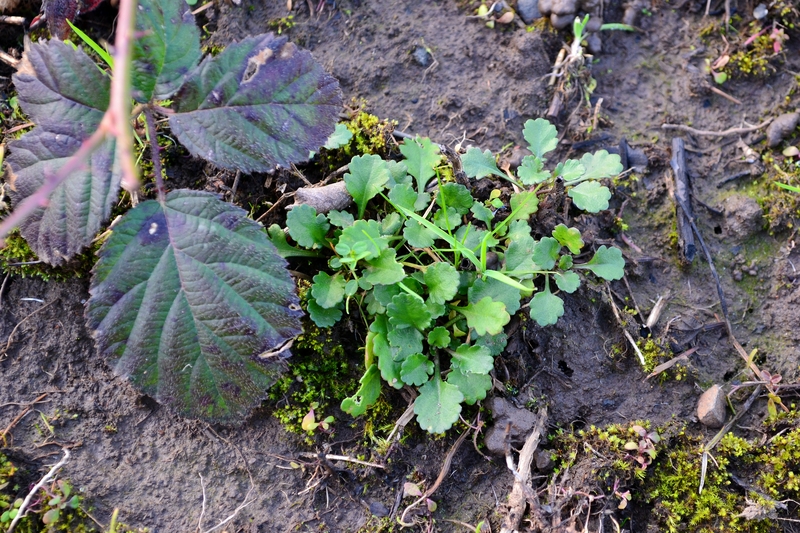 Oxeye daisy and Bittercress don’t contribute much to the bulk of the dish, but where they lack in size they make up with intriguing spice-like flavors. All together they create the perfect base for a ‘wild’ salad. All ready for the plate after a thorough washing. I’d hate to patronize you by explaining how to make a salad. So I’ll just point out a few key tips. As with any produce you prepare, a good wash will help remove any lingering dirt or bugs. Some people swear by the ripping of leaves over cutting/slicing them with claims of a better flavor. I personally rip them for the sake of time. 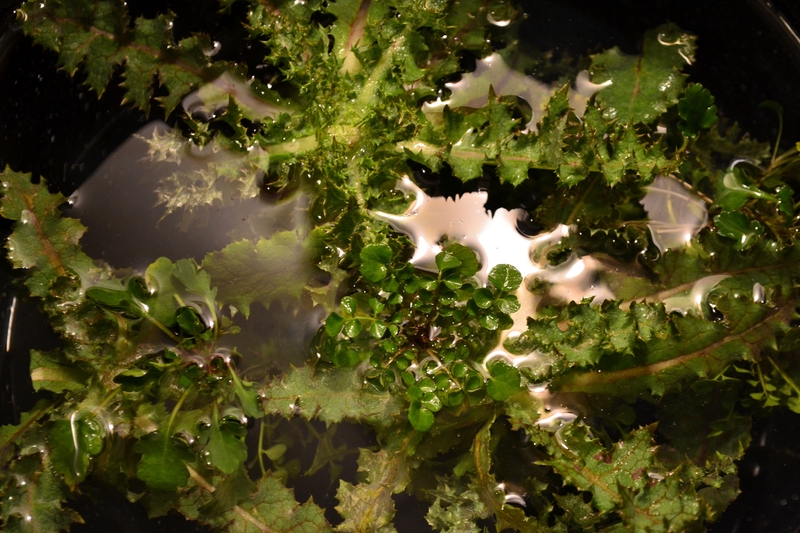 In the case of Thistle, I only use 2/3 of the outer length of the leaf. The closer towards the stalk the more firm its pokers are. A drizzle of extra virgin olive oil and a splash of red wine vinegar makes for a simple vinaigrette. Of course you can add all the extra goodies you like, but as for me I’m going to stay true to the foraging experience. An afternoons walk, a satisfying harvest and enjoying a January Salad.